Confidential Mission is a light gun game from Sega. In this offering, the player takes the role of either a James Bond-type secret agent, the smooth Howard Gibson or his female partner, the sultry Jean Clifford. The games can be played by 1 or 2 players and gameplay is reminiscent of the Virtua Cop series. However Confidential Mission is not a straight up shooter, also including other elements such as martial arts, diving and parachuting. The player must also rescue damsels in distress from the side of a speeding train, and the player can use a variety of high tech gadgets to help them against enemies. There are also a variety of minigames within the gameplay, with the players success or failure in these games impacting on the progression of the main storyline. Confidential Mission is a light gun game from Sega. In this offering, the player takes the role of either a James Bond-type secret agent, the smooth Howard Gibson or his female partner, the sultry Jean Clifford. 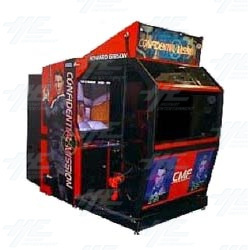 The games can be played by 1 or 2 players and gameplay is reminiscent of the Virtua Cop series. However Confidential Mission is not a straight up shooter, also including other elements such as martial arts, diving and parachuting. The player must also rescue damsels in distress from the side of a speeding train, and the player can use a variety of high tech gadgets to help them against enemies. There are also a variety of minigames within the gameplay, with the players success or failure in these games impacting on the progression of the main storyline.